TVNZ has confirmed one of the industry's worst kept secrets, announcing that Breakfast will now be hosted by Hilary Barry and Jack Tame. The show's current presenters Rawdon Christie and Nadine Chalmers-Ross are both leaving TVNZ. As previously reported by the Herald, weather presenter Sam Wallace will remain with the programme, while Wellington-based reporter Daniel Faitaua will come on board as the newsreader. 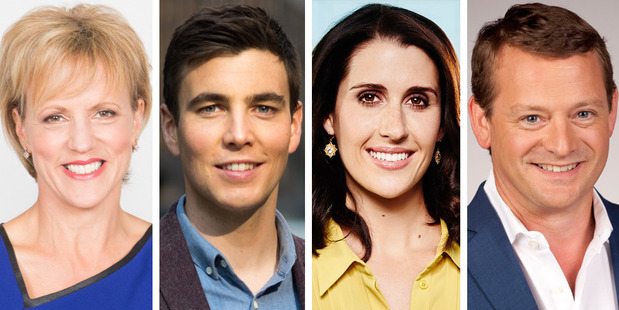 TVNZ's Head of News and Current Affairs John Gillespie confirmed the news today, thanking Chalmers and Christie for their "contribution to the show". "There's been a lot of attention focused on Breakfast over recent weeks and throughout it all they have been consummate professionals," Gillespie says. Christie's last day with TVNZ will be September 9 and Chalmers-Ross will finish up on September 16. Christie, who described hosting the show as "the best job in television, working with the most dedicated team I have ever been a part of", has put 3000 hours of live TV to air since he started on the show. He says: "Now is a good time for me to take a break and assess the new commercial opportunities in the fast-evolving media landscape." According to Gillespie, TVNZ hoped to keep Chalmers-Ross in another role, but she declined, opting instead to "explore other opportunities". Chalmers-Ross signed off noting the stories she has had the pleasure of working on, but "more importantly, I've had the pleasure of working with some of the best camera ops, producers, studio crews and journalists in the business. "I'm now excited about the opportunities on the horizon - and the prospect of turning off my 3am alarm." Ali Pugh and Peter Williams will remain with the One News team. Hilary Barry and Jack Tame will join the Breakfast team on September 19.